Trump spoke in the Oval Office Friday, answering”I don’t, really” when asked if he felt that the racist movement was a rising threat around the world. Lawyers for a gunman who killed six people at a Quebec mosque in 2017 say their client is troubled his name is being associated with the mass killings at two New Zealand mosques Friday that claimed at least 49 lives. Charles-Olivier Gosselin and Jean-Claude Gingras released a statement Friday stating convicted killer Alexandre Bissonnette is not looking for his acts to be imitated or to serve as a model for others. Bissonnette was sentenced to life in prison without possibility of parole for 40 years. Both the prosecution and his lawyers have recently announced they are appealing the sentence. Gosselin and Gingras say Bissonnette profoundly regrets what he did and has been very affected by the shootings in New Zealand. The attacks by an immigrant-hating white nationalist killed 49 people and injured dozens of others. Swedish YouTube personality PewDiePie says he feels sickened that the alleged gunman in the New Zealand mosque attacks referred to him during a livestream of the shooting. PewDiePie is famous for his video game commentaries and has some 86 million followers. YouTube distanced itself from him in the past after he made jokes criticized as anti-Semitic and posted Nazi imagery in his videos. He has apologized. Pakistan’s foreign ministry says four Pakistanis were wounded in mass shootings at two mosques in the New Zealand city of Christchurch. Ministry spokesman Mohammad Faisal tweeted that five other Pakistani citizens are missing after Friday’s attacks. He said Pakistani diplomats in New Zealand are in contact with local authorities. 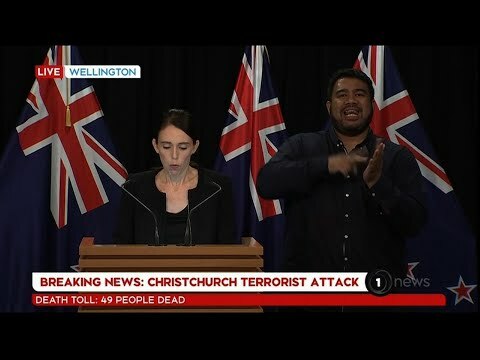 It asked New Zealand to take immediate action to bring the perpetrators to justice and ensure the safety of the Muslim community. Turkish President Recep Tayyip Erdogan says at least three Turkish citizens were injured in attacks on Muslim worshippers in New Zealand and that he has spoken to one of them. Addressing an election rally on Friday, Erdogan described a suspect in the attacks as “impertinent, immoral, vile and scum” and said he had chosen innocent worshippers as an easy target. New Zealand authorities have arrested and charged a man with murder in what appeared to be a carefully planned racist attack. At least 49 people died. Dozens of demonstrators protested the shootings after Friday prayers in Istanbul. Indonesia’s foreign ministry says two Indonesians, a father and his son, were injured in mass shootings at two mosques in the New Zealand city of Christchurch. Ministry spokesman Arrmanatha Nasir says the father is in intensive care and his son is being treated at the same hospital. He declined to identify them. The man’s wife, Alta Marie, said on Facebook that her husband, Zulfirman Syah, and their son are being treated at Christchurch Hospital. At least 49 people were killed and 48 others were hospitalized as a result of the attacks Friday. Bangladesh’s honorary consul in Auckland, New Zealand, says three Bangladeshis were killed in Friday’s mosque attacks in Christchurch and at least four others were injured. Shafiqur Rahman Bhuiyan says “so far” three Bangladeshis are among the 49 people killed in the shootings. He said two of the injured Bangladeshis are in critical condition. He says one person’s leg had to be amputated and another has gunshot wounds to his chest. New Zealand health authorities say a total of 48 people are being treated at Christchurch Hospital for gunshot wounds. Facebook says it has taken down a video of shootings at a New Zealand mosque and removed the alleged shooter’s accounts from its platforms after being alerted by police. The man who allegedly carried out the shootings in Christchurch on Friday reportedly broadcast 17 minutes of the attack on a Facebook livestream. Both YouTube owner Google and Twitter also say they’re working to remove video of the shootings from their sites. New Zealand health authorities say 48 people with gunshot wounds are being treated at Christchurch Hospital after mass shootings at two mosques killed 49 people. The chief executive of the Canterbury District Health Board, David Meates, says the patients range from young children to adults and the injuries range from minor to critical. Meates says 12 operating theaters are being used and some patients will need multiple surgeries. He says about 200 family members are at the hospital early Saturday awaiting news about their loved ones.